Joseph E. Fallon writes that prior to 1894 and the �Great Rapprochement�, which grew into the �Special Relationship� that defines contemporary British-American relations, Washington viewed London as �the enemy�. The objective of U.S. foreign policy throughout the Nineteenth Century was in the words of Thomas Jefferson ��the final expulsion of England from the American continent.� To that end, the U.S. declared war on the British Empire in 1812, and threatened war in 1839, 1844-1848, 1849-1850, 1852, 1854, 1856, 1859, and 1894. Washington failed to expel the British from Canada, but succeeded in ejecting the British from much of Central America. Washington achieved this by abolishing the British Protectorate of the Miskito Kingdom. The Miskito Kingdom effectively exploited the rugged terrain of the Central Highlands of Central America separating it from the Spanish Pacific Coast, and its acquisition of European weaponry to defend its political independence and territorial integrity from repeated Spanish incursions. Displaying a remarkable political continuity, which rivaled many of the Royal Houses of Europe, the Miskito kingship was held by a single family for the last 239 years of the state�s existence. The kingdom was a stable and successfully, indigenous country in a region often convulsed by Spanish colonial political turmoil.� In 1638, London officially recognized the Miskito Kingdom as a sovereign state and in 1710, concluded an official treaty of friendship and alliance establishing a protectorate over the country that would endure for nearly two centuries. Washington became acutely interested in the Miskito Kingdom during the California Gold Rush (1848-1855). Travel across the Miskito Kingdom to the Nicaraguan Pacific Coast then by ship to California provided a quick and safe passage for Americans journeying from the Eastern States to the West Coast. U.S. businessman, Cornelius Vanderbilt who operated a railroad in Nicaragua used by these Americans, proposed building a canal to facilitate the journey. Washington wanted American control over such a canal. Since the Atlantic Terminus would be the Miskito port of Greytown, Washington engineered the overthrow of the British Protectorate of the Miskito Kingdom. This would occur in four steps � continuing even when the proposed canal was abandoned. First, Washington negotiated with London on building a transoceanic canal. This resulted in the Clayton-Bulwer Treaty of 1850. Article 1 set the stage by calling for the �neutralization� of the Miskito Kingdom. �The governments of the United States and Great Britain hereby declare, that neither the one nor the other will ever obtain or maintain for itself any exclusive control over the said ship canal; agreeing that neither will ever erect or maintain any fortifications commanding the same or in the vicinity thereof, or occupy, or fortify, or colonize, or assume or exercise any dominion over Nicaragua, Costa Rica, the Mosquito coast [the Miskito Kingdom], or any part of Central America�� [iv]�� This left the Miskito Kingdom defenseless, exposed, and vulnerable. Fourth, in 1894 the U.S. supported Managua in rejecting this decision and annexing the Miskito Reserve. When the Sandinistas first seized power (1979-1989), they passed Autonomy Law 28 [xiv] for the indigenous peoples of the former Miskito Kingdom; however, it granted little meaningful powers or protections to the Miskito, Mayangna, Rama, Gar�funa, and Creole. Instead, it partitioned their land into two autonomous regions and continued the colonization and exploitation of their land. This policy was continued by successive regimes and the returning Sandinistas. The objective of Nicaraguan colonization is to alter the demography of the autonomous regions. It is to establish a Nicaraguan �majority�, so if the regions were allowed to vote on independence it could be defeated �democratically�. This is the strategy currently being employed by Morocco in the Western Sahara. [xviii] It is the same strategy previously employed by Saddam Hussein in his �Arabization� campaign of Iraqi Kurdistan. If the international community can support the restoration of independence for Estonia, Latvia, and Lithuania, it legally must support the restoration of independence for the Miskito Kingdom. As the Miskito Kingdom was a British Protectorate, London and the British Commonwealth should take the lead in seeing this objective is realized. *This is an Executive Summary of the article "that we poor Indians may receive our rights": U.S. Strategic Interests in Central America And the Dispossession of the Miskito Kingdom, Fourth World Journal, Center for World Indigenous Studies, Summer 2016, Volume 15, Number 1. pp. 5-46. http://cwis.org/FWJ/issues/# , which covers in greater detail the history of the Miskito Kingdom including the planned Chinese Nicaraguan Canal. Joseph E. Fallon is a subject matter expert on the Middle East and Central Asia. He has taught at the U.S. Army War College, U.S. Army Intelligence Center: lectured at the Defense Institute of Security Assistance Management, and for the U.S. Defense Departement's Cultural Knowledge Consortium. In addition to his primary focus on the greater Islamic World and domestic and international terrorism, he has researched and written on the situation of various indigenous peoples in Asia, Africa, and North America. [iv] Yale Law School Lillian Goldman Law Library, The Avalon Project: Documents in Law, History, and Diplomacy. (2008). The Clayton-Bulwer Treaty, British-American Diplomacy, Convention Between the United States of America and Her Britannic Majesty. Government Document http://avalon.law.yale.edu/19th_century/br1850.asp. [v] Stephen Luscombe. Bay Islands. The British Empire, http://www.britishempire.co.uk/maproom/bayislands.htm. [vi] Library and Archives of Canada, Government of Canada. (2016). Influence of the American Civil War. http://www.bac-lac.gc.ca/eng/discover/politics-government/canadian-confederation/Pages/influence-american-civil-war.aspx. [x] Wolfgang Gabbert. (2007). In the Shadow of the Empire - The Emergence of Afro-Creole Societies in Belize and Nicaragua. Indiana. n�m. 24. p. 52 http://www.redalyc.org/pdf/2470/247016522003.pdf . [xii] Anne M. Larson and Jadder Lewis-Mendoza. (2012). Decentralisation and devolution in Nicaragua�s North Atlantic autonomous region: Natural resources and indigenous peoples� rights. International Journal of the Commons. pp. 179-199. https://www.thecommonsjournal.org/articles/10.18352/ijc.315/. [xiii] Peter Sollis. (October 1989). 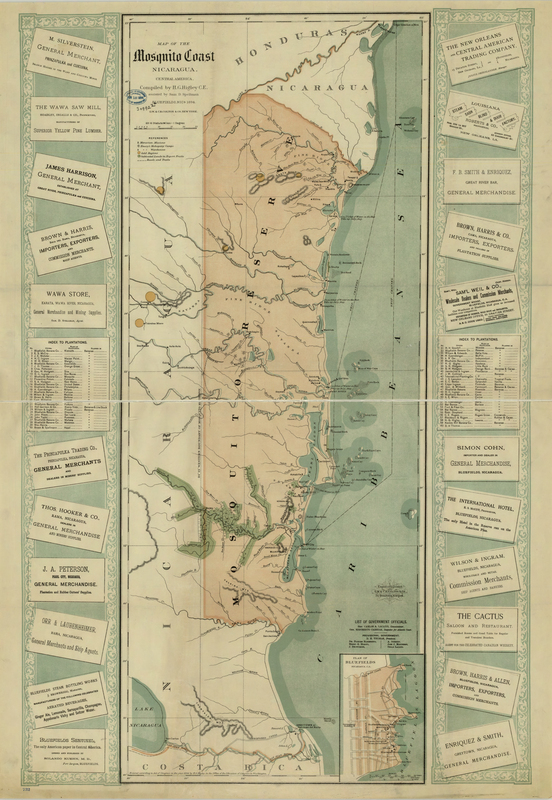 The Atlantic Coast of Nicaragua: Development and Autonomy Journal of Latin American Studies . Vol. 21, No. 3. p.492 http://www.jstor.org/stable/156960?seq=12#page_scan_tab_contents. [xiv] The Autonomy Statute (Law No. 28), Autonomy Statute for the Regions of the Atlantic Coast of Nicaragua. http://www.calpi-nicaragua.org/the-autonomy-statute-law-28/. Government Document. [xix] The Genocide Convention. (1948), Convention on the Prevention and Punishment of the Crime of Genocide, http://www.preventgenocide.org/law/convention/text.htm Government Document.